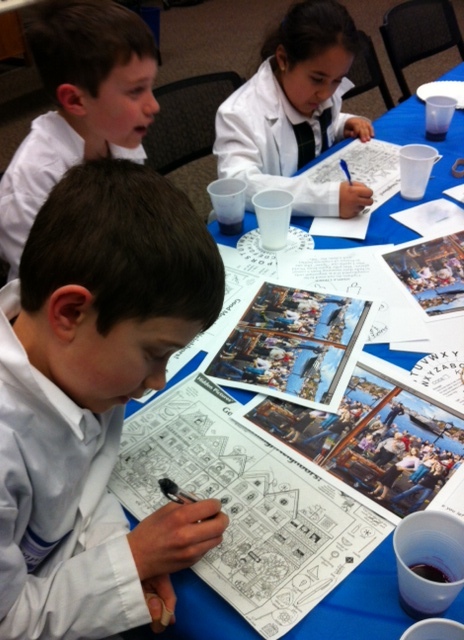 Our G3 scientists know exactly how to have fun on snowy winter days…talking about spies and spy technology! Our recent program focused on spies and all of the cool gadgets they use. As always, we began with a presentation that introduced a lot of really interesting history about spies and the tools they have used through time. Spies and espionage were being talked about as early as 400-500 BC, when a Chinese diplomat and military strategist named Sun Tzu wrote a still very famous book called The Art of War. In his book, he said that “…an army without secret agents is exactly like a man without eyes or ears,” and he described different types of spies and various techniques they could use to gather information about enemies. 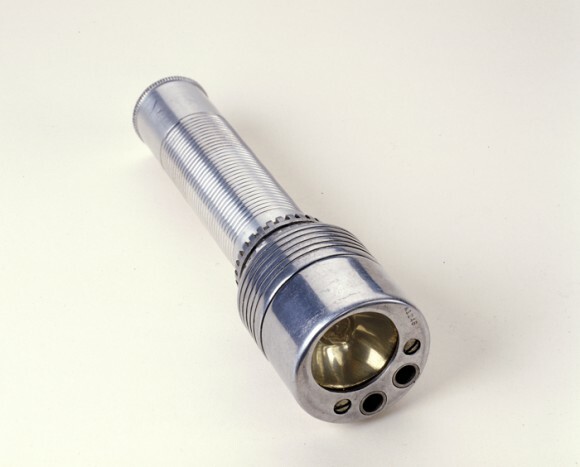 Many famous leaders throughout history have made great use of espionage and spy tools. Take for example Julius Caesar. He invented an alphabet cipher that has actually come to be known as the “Caesar Cipher” and was used for all of his communications with his army generals and key contacts. It is one of the simplest and most used shift ciphers. Basically, the cipher alphabet is the plain alphabet rotated left or right by some number of positions. For example, by shifting all letters 3 places to the left, the letter A would be replaced by the letter D, the letter B would be replaced by the letter E, etc. Alexander the Great also used spies, and Ghengis Kahn made a point of recruiting local people from the villages he conquered to act as his spies. Spies aren’t just men, though. There have been many famous women spies throughout history. During the Civil War, both Belle Boyd and Mary Elizbeth Bowser were active and successful spies. Boyd spied for the Confederates by mingling with Union soliders that gathered at her father’s hotel. And Bowser pretended to be an illiterate servant so she could listen in on the Confederate President’s conversations and bring information back to the Union troops. One of the most famous female spies was Mata Hari. She was a double agent that spied for both the French AND the Germans during World War I…until she was betrayed and then executed (by hanging) for her crimes. The CIA felt it was too much of a security risk to allow a person to come to their offices and mow their lawns…so they had their scientists invent robot lawnmowers to do the job! Every 5 years, all CIA employees MUST take a lie detector, or polygraph, test. The CIA is always monitoring every single television station and program. The CIA has its own police force…and its own zip code! Some medicines may cause people to talk while asleep during an operation. If a CIA officer has surgery, another CIA officer must be there to make sure nothing secret is said. 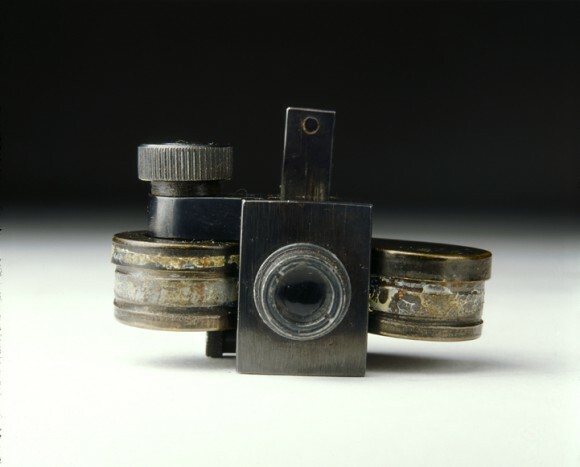 The Microdot Camera was particularly cool, and is still used today. 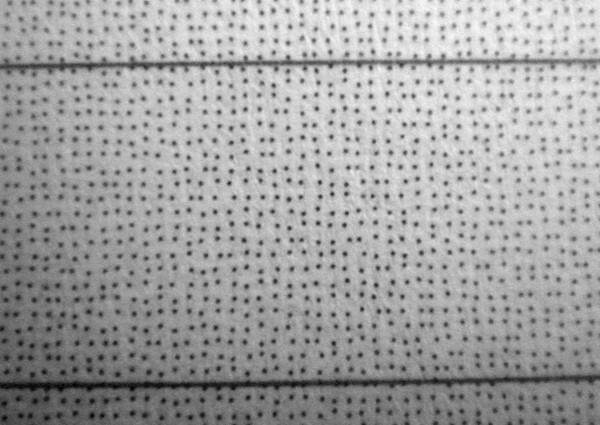 It can convert a full page of text into a tiny dot that then requires the recipient to read it through a microscope! The flashlight gun is no doubt a particularly effective weapon – I imagine that a spy/agent could blind an enemy with the light and then shoot. Our G3 scientists also learned about the true story behind the Bulgarian Umbrella. The KGB (the Russian secret service) decided to kill a famous Bulgarian writer and had one of their agents sneak up behind the Bulgarian and poke him in the leg with an umbrella designed to inject a poison capsule. Needless to say, the Bulgarian got poked and a few days later died from the poison. Grape juice is the key to revealing the secret message! You mix the baking soda and water together in a cup. 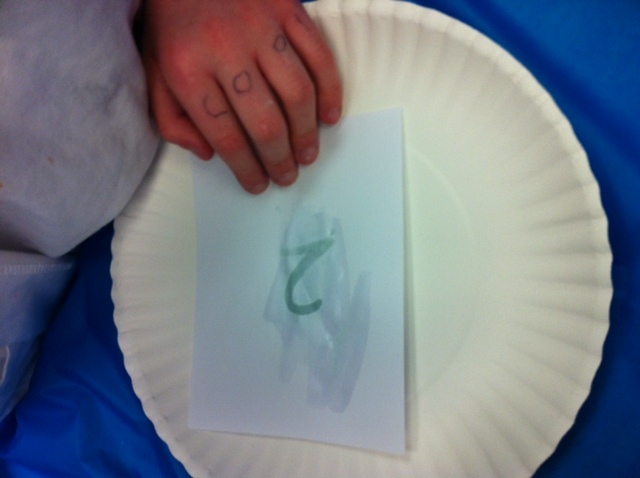 Once mixed, you can use either a paintbrush or a cotton swab (we used cotton swabs) to dip into the baking soda/water mixture and write your message on a blank piece of paper. Once the paper is dry, lay it flat on a surface (preferably with a tablecloth or something underneath to protect your surface). Dip a clean cotton swab into some regular grape juice, and rub it back and forth across the paper. 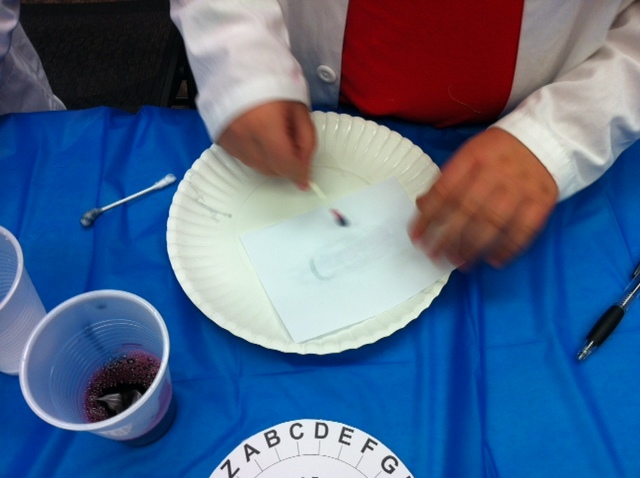 The grape juice reacts with the baking soda to reveal your secret message! Next, I showed our scientists a neat “spy” trick I learned in The Master Spy Handbook by Rain Newcomb: The coded rubber band! Finally, you pull the rubber band off of the book and let it shrink back to it’s normal size. Voila! Your original message should be very difficult to read once the rubber band shrinks. You can shoot the rubber band to the person your message is intended for. All they have to do to read the message is stretch the rubber band back out. As an example, check out the before and after pictures of a rubber band message from one of our very own G3 scientists below! 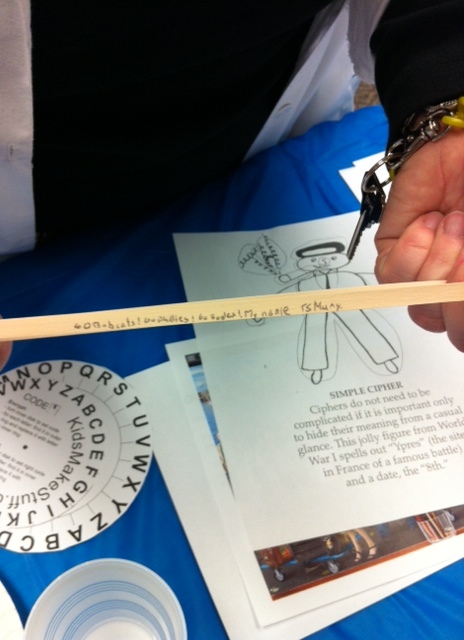 Secret Message Rubber Band – message revealed! I knew we also needed to test our scientists’ powers of observation. I distributed several puzzles and codes for them to decipher/work on, including a “Find the Hidden Picture” puzzle from a recent Highlights Magazine, a ‘compare the 2 images and spot the differences’ puzzle, and a genuine picture cypher from World War II for them to find a hidden meaning in. Both groups did a great job finding the solutions…without using my answer keys! 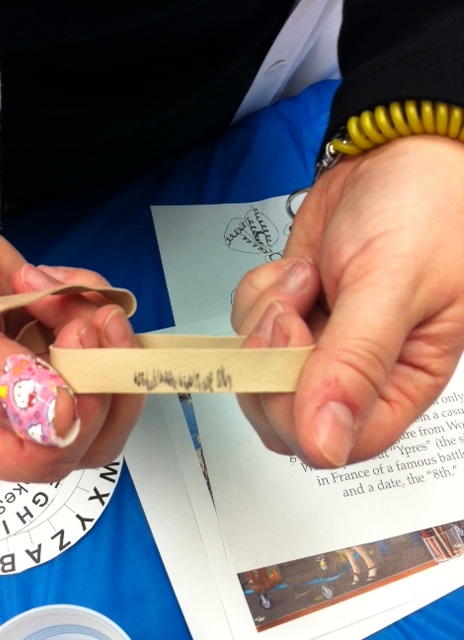 Our cipher wheel – tricky stuff! 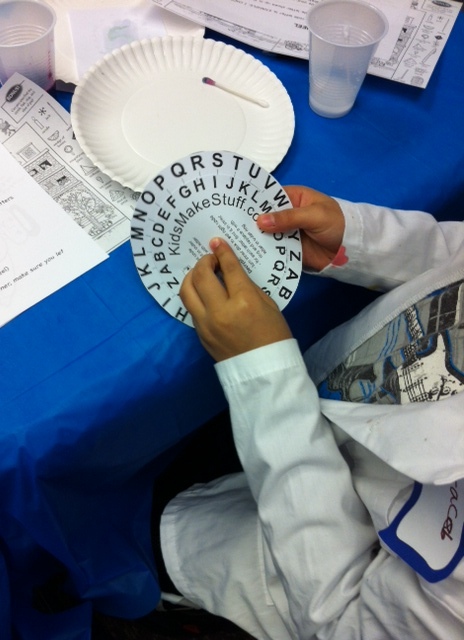 Finally, we attempted to use a cipher wheel (our template came from Kids Make Stuff). 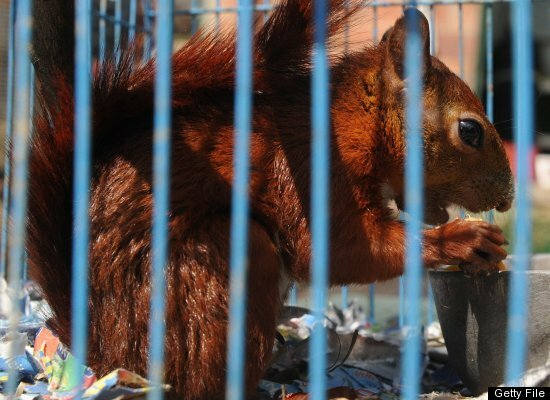 This task proved the most challenging. Many of our scientists took it home with my instruction sheet to play with it some more in their free time. Some of the scientists started to get the hang of it before our time ran out. Basically, to encrypt text (or make it secret) you first turn the inner/smaller disk to set a code letter (that letter will appear through the small cut out window in the smaller disk). Then, for each letter of your message, you find your letter in the outer ring and replace it with the letter shown on the inner ring. To decode text, you turn the inner disk to set the correct code letter (as given to you by your partner), and then you find each letter of their message on the smaller disk and replace it with the true letter shown on the outer disk.